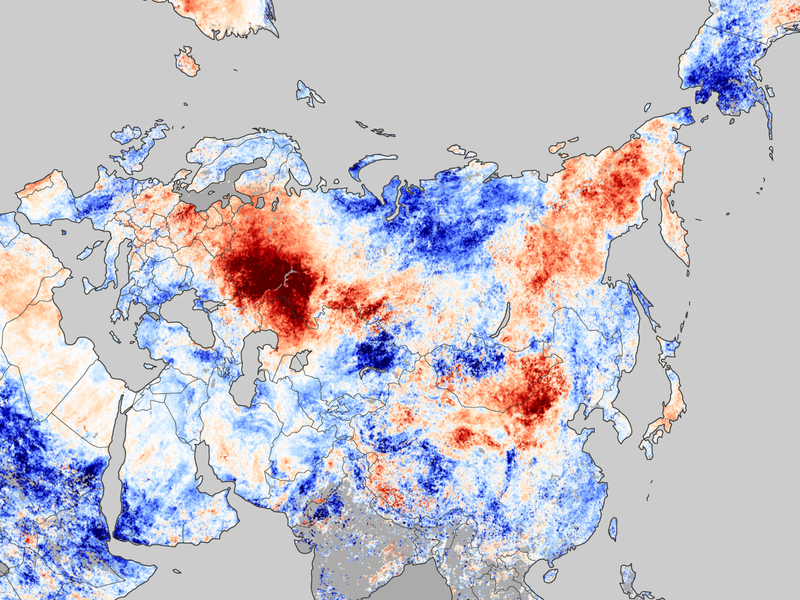 More on the Russian heat wave – satellite analysis | Watts Up With That? Not all parts of the Russian Federation experienced unusual warmth on July 20–27, 2010. A large expanse of northern central Russia, for instance, exhibits below-average temperatures. 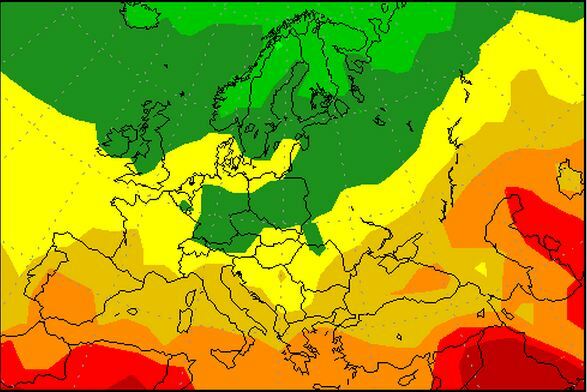 Areas of atypical warmth, however, predominate in the east and west. 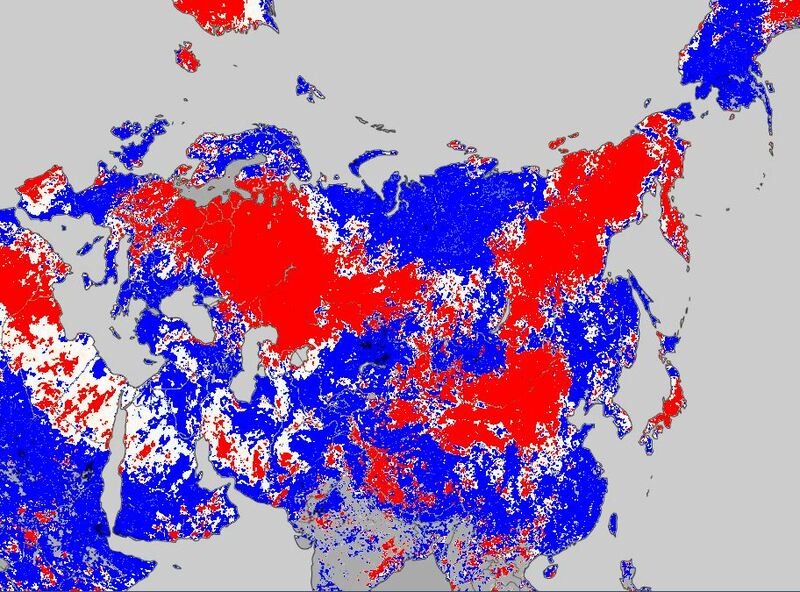 Orange- and red-tinged areas extend from eastern Siberia toward the southwest, but the most obvious area of unusual warmth occurs north and northwest of the Caspian Sea. These warm areas in eastern and western Russia continue a pattern noticeable earlier in July, and correspond to areas of intense drought and wildfire activity. Looking at the NASA image, it is clear that more land is below normal temperatures than is above. So I generated the map below, which flattens all areas of above and below normal temperatures. It turns out that the map has 43% more pixels which are below normal than above normal. The map is not a perfect equal area projection, so the 43% is not a precise number. But it does give a feel for the fact that the Moscow heat wave was just weather. According to NCEP, Moscow temperatures are about to come crashing down. 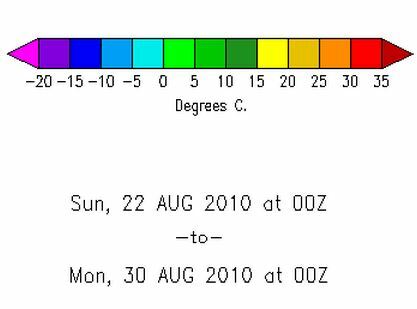 August 14, 2010 in Weather. Funny how the MSM books the story as AGW. I am not sure that reality trumps perception. I can just hear the refrain, we must act now to control these horrible events and secure the future of our children. Some areas are warmer than normal while others are colder than normal. This proves that global warming is real! All I know in England is that I am contemplating putting on socks and shoes – and it’s August, not the middle of flipping winter. I’m going to Cornwall tomorrow and am having a helluva time deciding what to pack- the winter dressing gown is definitely going. Brrrr. (The one good thing is that it has been raining so I am not too worried about the veg patch dying while I’m away.) A definite feel of autumn in the air. Is that weather or climte? It’s important to note that while there are weather forecasters who were able to be fairly specific in forecasting the heat in Russia global warming did not forecast it or the heat in New York or the flooding in Pakistan and China. Global warming just says it’s going to get hotter and disasters are going to happen. Global warming paints with a broad, generalized brush. That leaves a door wide open to then say that any heat or disaster anywhere in the world is caused by global warming, regardless if the world overall is warming or cooling. Right now the world overall is cooling. Record heat has always happened in the earth at any given location and at any given time. And disasters like flooding has always happened in the earth. Susan Brooks Thistlewaite of The Washington Post has it covered. It’s not “Global Warming” because the planet stopped getting warm. It’s not “Climate Change” because that’s not scary enough. The proper term is “Global Weirding” because the weather is different all over the place. I think that the map may be a “latitude/longitude” projection. In which case the pixels essentially DO represent equal areas. It would be worth capturing and adding to the post (before it changes). Steve, thanks for your analysis! The ongoing fires near Moscow are interesting, apparently Stalin ordered vast areas of wetlands drained, resulting in the dry peat areas that are presently on fire. I haven’t been able to find verification of this and it might be an urban legend, but considering all the environmental damage that the Soviets caused, I think it is plausible. Whatever happened to “Weather is not Climate” ???? AAiM, thanks for that video of Piers Corbyn. I knew he was mad, but I had never seen him in action. Can’t we just start every single article on WUWT with all those Youtube videos you keep on linking to? And in addition to the cooling in Moscow, Kazakstan, which has seen persistant cold waves, will get even colder. Here’s an idea that might be interesting. How about re-do the map above (or maybe a golbal map? with the colour bars reversed so that the cooler parts are red and the hotter parts are blue. Then lets compare them to see which appears to be the “hottest” That might be a beter way to identify the bias in interpretation? Just an idea. Is there a link to NASA high resolution temperature anomaly maps like the one for Russia? In response to a reader request a few weeks ago, I predicted that Chelsea would win the Premiership again this year. Anyone want to take me up on that bet today? It’s truly amazing, that once again, the GCM’s got it backwards, yet Piers and Joe nailed it. As early as 1918 Soviet engineers drained swamps to supply peat for electrical power stations. That approach was abandoned in the late 1950s, after natural gas was discovered in Siberia, but the bogs were never reflooded, though the authorities are currently weighing the idea. The irrational crowd says CO2 drives this. That means the temps can’t drop unless CO2 drops. Joe Romm already polled his pals. Off topic, but can anyone direct me to a discussion about the ‘failure’ of the NOAA-16 satelite and its implications on NOAA’s reported temperature data? Come on Steve, this isn’t graduate level stuff. You cant just count warm/cold pixels and make a claim about the overall temperature trend. You have to weight each pixel by its relative color — right now you’re treating pixels that are +12 the same as -1 pixels, and vice versa. I’m still trying to figure out how more water and a longer growing season is a catastrophe. Gunther the day you’ll forecast weather as well as Piers, we’ll add you in our favs. Calling him mad says more about you than it does about him. He has a better track record for accuracy in long term forecasting than The Met office in the UK. And maybe better than everyone in the world. If you know of someone better will you tell me about him or her? And does Piers Corbyn having a better success record than The Met effect what you think of The Met? Are they worse than mad? Video is mightier than the pen. It is easier to learn from them than reading. I have seen the view count from the videos I post and there is a fairly consistent number of views. I think people want to learn. I’m pretty sure that’s why they come to WUWT in the first place. But I think a few make it part of their life to come here and ridicule what they see happening here because they know how effective WUWT is. They are worried. Did you know the 2 on videos “How ClimateGate scientists do the anomaly trick” got a higher number of views than others have. If you’d like to see them I could post links. BTW, you too are able to link videos. I don’t try to make the first comment. In fact I don’t like to have the first comment. The only reason there are 2 videos from me so close together and so close to the top of the thread is because it’s a Saturday. It’s quiet. Usually there would be more comments between. It seems that some that are critical of WUWT like to be the first to comment in a post. It used to be common for that to happen. And those critical comments weren’t even on the topic of the post all the time. I suppose they thought they could make an impression if the spoke up right away. Well, they did make an impression. LOL – the add that displayed between the article and comments was for RussianEuro.com – Find your Russian Beauty Today! Hahahaha Heat wave or not, those Russian girls are HOT! Sorry about that – my nerd is showing. You did not state what time interval you are using to define normal. Therefore your map has no meaning. You of course know this. Like any propaganda tool you assume most readers won’t pick up on the details. I believe it is for 2000-2008. Why not use 1900-1950? And why of earth would you “flatten” the magintudes? Integrate the actual magnitudes if you want a meaningful number. There is a legitimate discussion as to what degree the Russian heat wave and Pakistani floods are caused or exacerbated by GHG emissions verse jet stream anomalies. You are not a part of that discussion. Funny models indeed, but not too funny if you think you PAID for all these childish games. Russian hackers will be hot enough before next november´s Global Warmers Jet Set sinful jamboree at Cancun, Mexico. A recent article in the New York Times titled In Weather Chaos, a Case for Global Warming contains this gem of admission…..
At least Gavin, on this occasion, admits he can not prove his opinion. The Arctic Sea Ice Extent and Area are 2 different looks taken from the same data. If he wants to count up the pixel values and come up with a mean or an average, I’m sure he’ll let us know. I have been referring to the “blocking events” as stuck weather patterns for over a year. I didn’t know they had a name, but I have observed them since 2008 in my own area. That’s a nice picture from NASA. The cold (dark blue) east of Moscow is more noticeable in that photo. You did not state what time interval you are using to define normal. Therefore your map has no meaning. Why are you always deliberately ignorant? It’s a NASA map, you moron. Like Steve said in his first sentence, before providing the link. The page explains anomalies are compared to 2000-2008. Frankly that’s too short a period by a long shot, but it was NASA who decided. When you make such stupid attacks, you ruin all your credibility. Why do it? Oh come on, soccer? It’s 3 1/2 weeks to Brett Favre. Can anybody tell me why these temperature anomolies in Russia are so high? Perhaps the twenty four degrees celcius range is due to CO2 produced by burning wheatfields? Maybe I need new glasses? Did anyone mention the cold areas like Pakistan and the SH? Good video interview with Piers Corbyn – thanks for that link. AAiM, thanks for that video of Piers Corbyn. I knew he was mad, but I had never seen him in action. I think you will find that Piers Corbyn is a brilliant but eccentric physicist. Eccentricity seems to run in the family. It’s what he says and predicts that is important, not your psychological analysis of him. Nice map link. Now, at last, California looks correct. A very very silly question. But is there any chance of a “feedback” going on here. Its hot . The fires get going and the heat generated gets incorporated into the measurements? Very stupid question but I do not pretend to claim any sort of knowledge on this. Here is an equal area projection for the globe in july with anomalies from baseperiod 1961 – 1990. You can count this pixels but I’d say that it is clearly warmer then the baseperiod. Yeah, it does when you can get the image like that. You’ll have to tell me how you got NEO produce that pic for you. I had to play with that dumb, gimmicky pan and zoom. Extreme weather events have been caused by global 24/7 news channels. There is a need to fill the airwaves and cyberspace with stories that would not have made it a few decades ago. It is more interesting to me. In Germany the first part of summer was very dry and hot. But in August a weather change was occurred; we are have a contrary weather. I think it will be so till fall. I think people want to learn. I’m pretty sure that’s why they come to WUWT in the first place. I know it’s tempting to think that, but in fact people only come here because they are told what they want to hear: That AGW is not a problem and that they are not responsible for anything. It is because this is a very common human trait (the psychological defense mechanism of denial when people are confronted with uncomfortable facts) that WUWT is popular, not because the truth, the whole truth and nothing but the truth is told here. It isn’t, unfortunately. If you are going to use maps in this way, then you should use an equal-area projection. Otherwise, the more northern parts take on greater weight than is fair. Too bad Steve isn’t in charge of the earth’s climate. I agree that if we could magically flatten out the temperature extremes that we would be more comfortable and there would be less concern for the future. Psychologising motives like that is puerile. I could write a similar excuses for why people hang out at Real Climate (“they want to bag consumerism”, “they want to be afraid”, “they want to feel that they are in the global vanguard”) but they would not cover a tiny fraction of the real reasons. I did not come here with the idea that Global Warming was not a problem. I came here because I was looking for some answers to questions that bothered me. At the time I arrived I was not decided. In the late 1950s there was a severe drought in China. Millions of people died after the agricultural areas received no rain for over a year. Was this due to AGW? This site is interesting 8 postings on August the 13th, on various subjects. On the other hand some sites have difficulty getting one or two postings together in a week. You don’t have to have the right opinion here either. Re: the red and blue color map. White out the 1 degree difference span and only show the significant above and below areas. This will show up the extremes better and will allow closer matching with the significant weather systems involved. I don’t care about the wriggles within the normal band, no matter which side they are on. Or is that what you did with the map already? If so, there ain’t much inside the normal band. You should put a caveat to that, you do not have to have the right opinion to read the site you mentioned there. But you do have to post correctly with the right opionion or it gets deleted. Lets be fair now, shall we? If I posted the same thing you just did on realclimate but pointed here for instance, the post would never see the light of day. And yes, people come here to learn. I doubt that a site indirectly owned by Al Gore can be said to be the conveyor of truth and knowledge. (Realclimate). What grades did Al Gore get in college in environmental studies? Well I guess it was about par for what he accomplished in college overall….. If you are going to link to realclimate, you will have to look at my ugly posts in your face everytime sprouting off the truth that wouldn’t see the light of day on realclimate. But lets not get ahead of ourselves. The reason this site is popular is because it offers not only good articles that are different then what the politically correct media offers, but because the commentary afterwards is generally spirited and well-thought out. I doubt many people here think everything we hear on this site is the entire truth, but I would hazard to guess it is much closer to the truth then anything else out there as far as climate goes. There might be other skeptic sites that might be marginally better, but they do not offer the full commentary that this site does. And for the record, this site says nothing about AGW not being a problem. This site seems to be more concerned with showing how wrong the proponents of AGW are. Most of us skeptics do not live in denial like you think we do. We know the science, and most of us would admit if we were found to be wrong by good science. In fact, most of us believe that CO2 DOES indeed effect the climate system. The degree to which it does is what most of us argue about. But the science has yet to prove what human’s actual effect on the climate is since climate scientists are too busy offering scare scenarios and over-exagerating press releases to manipulate the common man. This is the behavior that I for one find immoral and wrong. If you have good science that can bear scrutiy, I say bring it on. But do not bring up how the psychological defense mechanisms of denial when people are confronted with uncomfortable facts as the reason this site is popular. That is a brain-dead attack on the site with no backing. If you could reference examples perhaps of how your hypothesis carries out, feel free. But just saying things without references does not really work here. Most people on this site are not in denial, we are living in reality. My question is thus: are you in denial about anything? This site is more popular than the others because of curiosity. The curiosity arises because the message being blared out of the Alarmist Woofers & Tweeters is in direct conflict with what people are experiencing. Such daily observations, by hundreds of millions, over the course of several years, started a murmur. You give a half truth when you say the people come here because they are told what they want to hear. The connotation of that half-truth is that they seek to be absolved of thier sins, and that’s the footprint of a religious dogma, not science. What they find here is what the Alarmist Agenda conveniently leaves out: What is happening to the Earth as a whole, and not simply the parts that fit the Alarmist focus. Why do people stay around here? Because they are shown the pieces and parts that the Alarmists hide from them, and they can come to thier own conclusions/paint their own canvas. I can’t remember where I read what follows (sorry), but the ‘unusual’ pockets of warm air at high latitudes and ‘unusual’ pockets of cool air at lower latitudes that we’ve experienced over the past two years or so is an expected consequence of less energetic jetstreams. 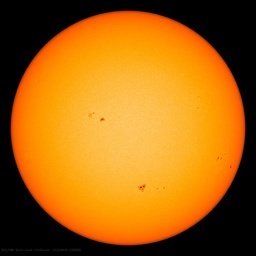 This in turn is due (indirectly) to the prolonged solar minimum. Naturally this applies in both hemispheres. If this is correct – and it certainly seems plausible – wouldn’t it be great if the warmists learn some basic science and read more widely, then we can all stop wasting money on carbon trading schemes and wind turbines. It’s also been hot here in Portugal. I love it this way! And the tourists, they also do too!!! Here Steve Goddard is missing the baseline years! This is the anomaly with respect to the 2000-2008 average, that is, the warmest 8-year period on record! Most of the area in the maps are very close to white, that is, warm in comparison to 1950-1970 average. This is NASA’s map, but feel free to add the claimed 0.4C warming since 1940 – if it makes you happy. That will make a “really big difference” in those extensive areas which were 5.0C below normal. Could it be that both the warmer and colder than normal areas are influenced by the same phenomena? I’m reminded of how a fireplace only warms a small part of the house but draws in cold drafts resulting in farther parts being colder. For Russia, I imagine the fires warm surrounding air, which ascends and draws the hot air off the surface. Think of a torus with the central area ascending and the outer area descending. The inner area draws warm surface air up and the outer area draws cool upper air down to the surface. Similarly, I wonder if urban heat islands actually result in rural cooling. It appears that the Yamal peninsula is cooler than normal. How can we hide the decline? Who in Hades are you kidding with that map Steve? I can see right away that the REAL map has a lot more concentrated red than concentrated blue. You can get away with this rabbit out of a hat trick because it is obvious that there is a lot more light blue than there is yellowish-orange. That should be considered noise. An extreme example of the absurdity of this scheme is to imagine the following. 1) 1/3 of the Earth 100 degrees Fahrenheit above normal. Water boils in the desert 100s of millions die of heat stroke. 2) 1/3 of the Earth 1F below normal. 3) 1/3 of the Earth 10F below normal. I suspect that the people who organized the Copenhagen Climate Change Conference last December might be wishing they had chosen to have that event in August 2010 at Moscow. @R. de Haan. Thanks for those links. Here’s another one. Maybe I’ve misread this NASA page, but it seems that they first say there’s a correlation between reduced solar activity and the observed cooling in the mesosphere, then in the latter part of the article they say that cooling in the upper atmosphere is an expected consequence of global warming in the troposphere. Are they just pandering to the global warming lobby? It certainly makes for confusing reading, especially when they say, “As the atmosphere cools the density will decrease, which ultimately may impact satellite operations through decreased drag over time.” As I understand the physics of gases, if a gas cools its density increases not decreases. Also, if drag decreases, well, that’s a good thing because low-Earth satellites will need less fuel to keep them in orbit thus will stay up longer. Buy, hey, I don’t have project funding to protect so who cares about the science.